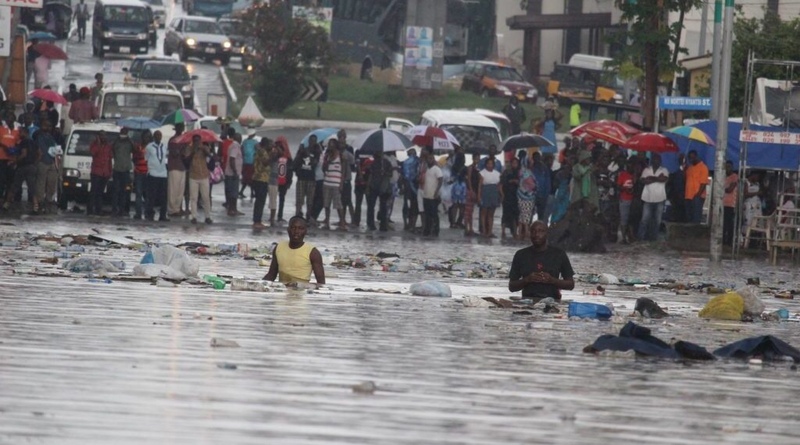 The Greater Accra Director of the National Disaster Management Organisation (NADMO) Archbald Cobbinah has confirmed that the Sunday downpour in Accra claimed four lives and one child cannot be accounted for. Speaking on ‘Epa Hoa Daben’ show he gave the break down as follows ‘he said out of the five dead persons, one was electrocuted after coming in contacted with live wire at Abossey Okai, another man believed to be in his thirties was found at Audome. A woman and her baby perished in the rain at Flamingo near Kaneshie first light, as did another man the baby however, has still not been found’’ he explained. He however, attributed the floods to largely human irresponsibility. ‘’ some people have extended the slaps on the gutters in front of their homes. And that makes it impossible to desilt the gutters’’ he stated. He also mentioned that NADMO does not have an official mandate to check the construction of drainages in the country. But he has on a few occasions used his rapport with some of the District Chief Executives in the Greater Accra Region to have some bridges demolished because there were shoddily constructed structures. He however called on plastic producers to come on board to help eradicate the perennial flood related deaths. ‘’ certain products are dominant in our gutters it is time manufacturers of such products help NADMO with logistical support to help reduce the impact of heavy rainfalls’’ he intimated.